Despite Peru’s President Ollanta Humala’s recent public display of optimism, indicating that his government is set to restart several large mining projects stalled since last year, Newmont Mining’s (NYSE:NEM) $5bn Conga project continues to be the bone of contention. Only last week, top authorities of the country’s gold-rich Cajamarca region, where the debated gold and copper project is being developed, said the majority of the population still rejects the project and that Newmont’s local partners —Buenaventura and Minera Yanacocha— have made no progress in gaining support from surrounding communities. In an interview with La Republica (in Spanish), Cajamarca’s governor Gregorio Santos accused the national authorities of washing their hands of the main issues that have generated strong opposition to the project. He said Peru’s leaders are doing so by leaving the responsibility of ensuring water supply to the region in hands of Yanacocha, instead of taking charge of it themselves. "The company is just waiting for a new governor to be elected next year, someone [who let the miner] go ahead with the project," he was quoted as saying. 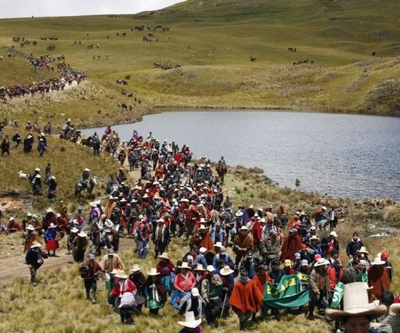 Violent protests against Conga, the largest ever single private investment in Peru, left a number of people dead last year, forcing Humala to order a suspension of all work at the site, except for the construction of water reservoirs. Yanacocha has said it is building the reservoirs with the cooperation of local communities prior to resume work on the mine in order to ensure the supply of water. Meanwhile opponents continue to hold protests, which get “smaller and smaller,” with time, in words of the country’s minister of energy and mines, Jorge Merino, as quoted by WSJ. "Conga continues to be a challenge," he was quoted as saying. "But we are confident that with this new relationship that the company is developing with the communities that Conga is also going to be developed." Yanacocha is 51.35% owned by Newmont. Compañia de Minas Buenaventura and the World Bank's International Finance Corp. also have a stake in the project. The mine, capable of producing up to 350,000 ounces of gold and 120 million pounds of copper per annum with a 19-year life of mine, was supposed to begin production in early 2015. But after almost a year of disruptions, Newmont warned in April that it was willing to reallocate capital to projects in other countries such as Australia, Ghana, Indonesia and the US. All Newmont has officially said about this in recent weeks is that a restart at Conga is "not imminent."